The 90 day truce will expire on March 1st and tariffs will go rise 10% to 25% on the $200 billion unless both sides reach a deal. Reportedly both sides are far apart as a US Trade Delegation is visiting Beijing this week – it’s been like “Like Pulling Teeth”. 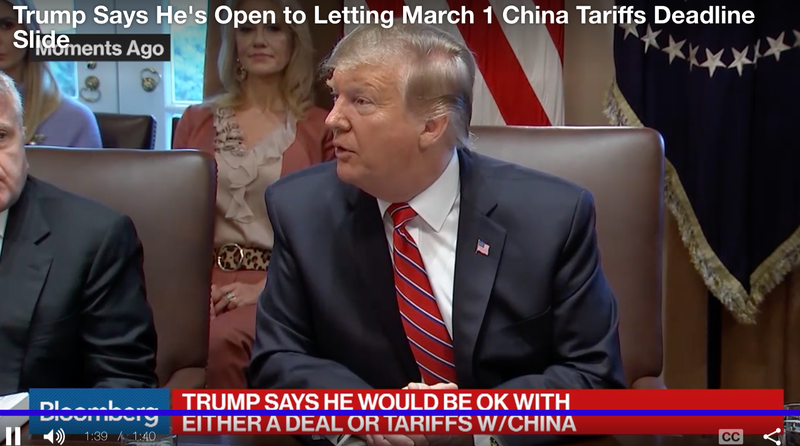 In a surprise move – Trump says he’s OPEN to let the March 1st deadline “SLIDE” if a deal is imminent. We’ll see how this pans out in the next few weeks. Meanwhile Is Vietnam the REAL winner from the US-China trade war? An NPR interview with supply chain expert Dan Krassenstein who’s shifted his sourcing from China to Vietnam and explains why. And also learn some unexpected downsides to sourcing from Vietnam. PS: Are you a fan of Shark Tank? If so, checkout a new youtube series called “The 5 Minute Pitch” to learn how entrepreneurs like you have discovered profitable product ideas and are pitching their ideas in 5 minutes to a panel of judges for a chance to win $50,000. It’s hosted by Greg Mercer (Jungle Scout), Mike Jackness (Ecom Crew), Scott Voelker (The Amazing Seller), and Steve Chou (My Wife Quit Her Job) who are the judges. and how they plan to execute the business plan. (Sound familiar?). And this is great learning for entrepreneurs and private label sellers! I especially liked the Cat in the Box and the Best in class Coffee Grinder. Check out this free new show here. The White House released a statement saying that China has agreed to purchase significant “agricultural, energy, industrial, and other product from the US”. Also China is allegedly considering allowing more access to its market, greater protection for intellectual property, and stopping exports of drug fentanyl into the US markets which has led to much abuse and deaths. The specifics of the treaty are beyond the scope of what we’re concerned with but as e-commerce sellers. But here is the Key takeaway as far as you’re concerned. But at end of 90 days, if no agreement is reached, then the tariffs will jump to 25% as previously stated according to White House representative Jill Sanders. The good news is that if your products are part of the $200bn package, then your tariffs will be kept at 10% during the truce as both sides are negotiating for a deal. They will not rise to 25% on Jan 1, 2019. However you’re not out of the woods yet. Whether there will be a “Real Deal” as Trump calls it or more clashing between both sides, time will tell! But at least the tariffs are not increasing as far as we’re concerned in the next 90 days. Not sure if your products are covered in the tariffs?